Breast cysts are one of the more common benign (non-cancerous) conditions that appear in the breast. 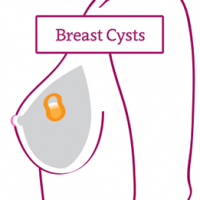 Some women feel cysts upon breast self-examination while others are detected on mammography exams. 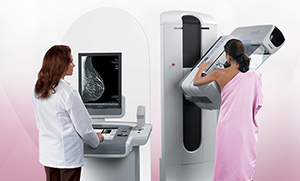 On mammography film, breast cysts are usually detected as rounded nodules with a smooth edge. Usually, the radiologist will suggest an ultrasound to further evaluate and confirm that these nodule-like appearances are fluid filled (which is a cyst) rather than a solid nodule, which would suggest further evaluation. A cyst may contain a solid nodule or other abnormality that may require biopsy. 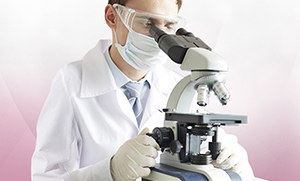 It is important to understand the structural makeup of the breast tissue. The glandular tissue, or milk ducts, is where milk production occurs. The stroma is the connective and supportive tissue of the breast. Those are the two major types of breast tissue. The percentage of glandular to stromal tissue varies from woman to woman. The glandular tissue is replaced by fatty tissue as a woman gets older. The replacement increases significantly after menopause. For a woman still having menstrual cycles, the breasts change during the month throughout the hormonal cycle. The estrogen level rises and causes the glandular cells to multiply and swell in preparation for a possible pregnancy. The ducts or glandular tissue lengthen and enlarge. This swelling and increased activity peaks from approximately day nine to around day 21. When ovulation occurs, an increase in the production of progesterone influences the cells to "practice" milk production. As blood supply to the breast increases, extra fluid seeps into the breast tissue through tiny blood vessels. Many women experience warmth, fullness, and discomfort at this time. If a pregnancy doesn't occur, a cleanup process takes place after menstruation. Extra fluids are returned to body circulation; any unused secretions are reabsorbed, and the process starts all over again. Over many years of build up, the cleanup process does not keep up with the buildup process. The breasts may receive faulty messages. Extra fluids and secretions build up into small or large cysts, which persist from month to month. Breast cysts may go unnoticed, but often a woman experiences some sort of tenderness associated with the tissue swelling or the enlargement of a cyst due to the menstrual cycle. If pain and tenderness persist, fluid can be removed from the cyst. Our surgeons perform the majority of biopsies to help build a relationship early on with patients facing a breast cancer diagnosis.